Ditch that casserole dish and grab your skillet! 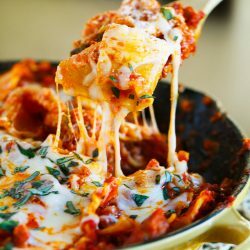 This ultimate skillet lasagna is going to change the way you make lasagna forever! In an oven-safe, 12-inch nonstick skillet, brown sausage over medium-high heat, breaking up the sausage into small pieces with a wooden spoon or spatula. Once the sausage has been broken up and mostly cooked through, add the onions and minced garlic. Cook for 2 minutes, or until softened and fragrant. Add the lasagna noodles to the skillet and carefully pour marinara sauce all over the top. Using your spatula or wooden spoon, move around the noodles so the sauce can get to the bottom and in between the noodles. Bring everything to a boil then reduce to a simmer and let cook until noodles have softened, about 15 minutes. You'll want to stir and toss the noodles every now and then so the heat is evenly distributed throughout to cook the noodles. Once the noodles have softened and cooked through, in a small bowl, stir together ricotta cheese and parmesan cheese. Pre-heat oven to broil. In large dollops, put ricotta cheese mixture all over the pasta dish and give it a stir but not entirely mixing it all in and having it disappear in the mixture. Sprinkle mozzarella all over the top of the pasta dish and put it in the oven under the broiler until cheese is melted and bubbly. Carefully remove from oven and garnish with basil (if using). You don't have to use hot Italian sausage if you don't like spicy. Feel free to use your favorite type of fresh sausage.